• Calhoun joins together to buy a handicap-accessible van as a surprise for the Miller family on Christmas Eve. When Joan White took her niece Ginger Miller and Miller's sons out to Cracker Barrel for lunch on Christmas Eve, the Miller family thought it was an ordinary holiday meal. But when Ginger was surprised in the parking lot with a 2009 Toyota Sienna van being presented to her by a few local friends, she knew her family's Christmas was anything but normal. Ginger Miller, a native of Calhoun and a graduate of Calhoun High School, always wanted to leave Calhoun when she was younger. But when she had her three sons, she realized that Calhoun was her home and decided to stay close to family. But staying in the area has had its own set of challenges. Her oldest son, Will Miller, 23, has cerebral palsy and cystic fibrosis, and their doctors are in Chattanooga, which requires a bit of a commute. And as of recently, their old van had been having problems, making transportation difficult and often unsafe. Throughout Will's life, Ginger's father Randall Woody had been a source of support with taking care of Will, lifting him and helping out in ways he could. However, Woody suffered from a few health issues this year and was no longer able to help out Ginger in the ways he used to. White said after Woody's health problems, Ginger quit her job to take care of Will fulltime. And as a single parent, this decision left the family in a tight financial situation, though Ginger was doing the best she could. Terry Knight is stepping away from his studio, which he opened after 30 years in education, but the legacy he has woven with students will last forever. Terry Knight, owner of the eponymous Terry Knight Studios in downtown Calhoun, will hand over the keys to new owner Jennifer Tinsley on Tuesday. Tinsley plans to call the studio Art by JennyPenny. Terry Knight's work hangs in the studio he's owned for the past 18 years. Terry Knight still has a collection of pages from the Sonoraville High yearbook that feature his students' work. He took care of the layout during his time teaching there. The funny thing about Terry Knight, the man so many Gordon Countians recognize as an institution in art education, is that he never really intended to teach. But when Knight tells his story, it's clear that his assertion that God had other plans for him must be true. Knight spent 30 years in the public education system bringing a creative outlet to young people as he taught them to sculpt, paint and sketch. 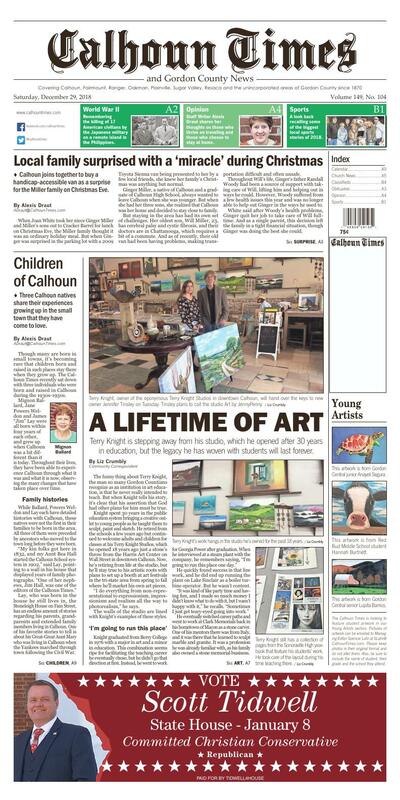 He retired from the schools a few years ago but continued to welcome adults and children for classes at his Terry Knight Studios, which he opened 18 years ago just a stone's throw from the Harris Art Center on Wall Street in downtown Calhoun. Now, he's retiring from life at the studio, but he'll stay true to his artistic roots with plans to set up a booth at art festivals in the tri-state area from spring to fall where he'll market his own art pieces. "I do everything from non-representational to expressionism, impressionism and realism all the way to photorealism," he says. The walls of the studio are lined with Knight's examples of these styles. Knight graduated from Berry College in 1976 with a major in art and a minor in education. This combination seems ripe for facilitating the teaching career he eventually chose, but he didn't go that direction at first. Instead, he went to work for Georgia Power after graduation. When he interviewed at a steam plant with the company, he remembers saying, "I'm going to run this place one day." He quickly found success in that line work, and he did end up running the plant on Lake Sinclair as a boiler turbine operator. But he wasn't content. "It was kind of like party time and having fun, and I made so much money I didn't know what to do with it, but I wasn't happy with it," he recalls. "Sometimes I just get teary-eyed going into work." He eventually switched career paths and went to work at Clark Memorials back in his hometown of Macon as a stone carver. One of his mentors there was from Italy, and it was there that he learned to sculpt marble and granite. It was a profession he was already familiar with, as his family also owned a stone memorial business. This artwork is from Gordon Central junior Anayeli Segura. This artwork is from Red Bud Middle School student Hannah Burtnett. This artwork is from Gordon Central senior Lupita Barrios. The Calhoun Times is looking to feature student artwork in our Young Artists section. Pictures of artwork can be emailed to Managing Editor Spencer Lahr at SLahr@CalhounTimes.com. Please keep photos in their original format and do not alter them. Also, be sure to include the name of student, their grade and the school they attend.